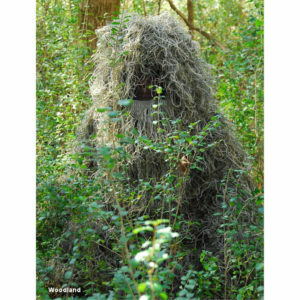 We have lightweight jacket and pants ghillie suits that are great for paintball and airsoft. 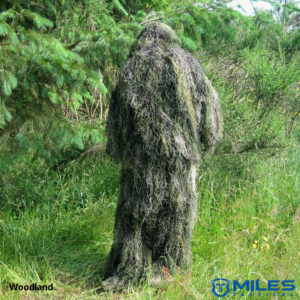 The Woodsman paintball and airsoft ghillie suit is one of the best suits we have in the jacket and pants style. 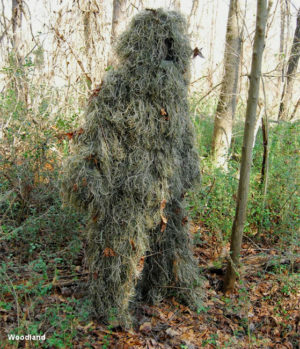 The Woodsman weighs only 5-6lbs as opposed to 8-10lbs for the jute ghillies. It is built on a light polyster mesh cloth that is smooth and comfortable to wear. On the outside of the polyster jacket is the netting and on the netting is tied the new lightweight synthetic thread. This design also allows you to quickly add vegetation to better match you surroundings. You can find a matching rifle wrap in the supplies and accessories section. 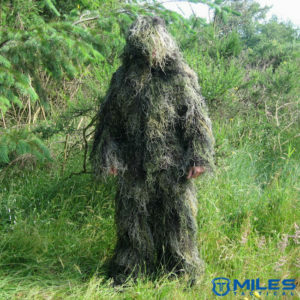 The Bulls-eye suit is extra light is also a popular paintball and airsoft Ghillie Suit. It is similar to the synthetic suits in design in that it also has a smooth inside liner and is an alternative to the standard jute Bushrag jacket and pants. It is also easy to add vegetation to this suit by tying it to the string.